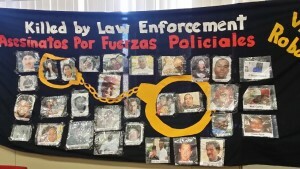 (APN) ATLANTA — A national conference sponsored by the Stop Mass Incarceration Network was held February 07 and 08, 2015 at the Interdenominational Theological Center at Atlanta University. A wide variety of people, approximately two hundred, from California to New York, attended. They came to Atlanta to prepare for a nationwide day of resistance, on April 14, 2015, to the epidemic of police killings of Black and Brown people. 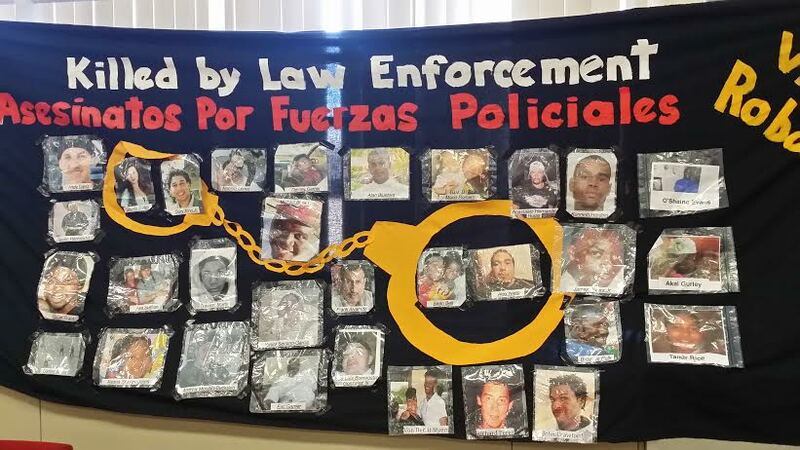 Dozens of families who have lost a loved one to police shootings, and others who have friends and family members currently incarcerated, shared their stories. The personal stories were heartbreaking, horrific, and unimaginable in a so-called civilized, democratic country. Reader discretion is advised. Their stories exposes an ugly underbelly to unchecked police authority, the militarization of police departments with war equipment, and the criminalization of a generation that is only beginning to bubble up into mass consciousness. “My son, Malcolm Ferguson, was murdered in the Bronx by a cop on March 01, 2000,” Juanita Young, with Families of Stolen Lives & Parents Against Police Brutality, told Atlanta Progressive News. Young explained that originally the police claimed her son reached for the police’s gun. Witnesses at the scene, however, said the police officer handcuffed Ferguson and then shot and killed him. “I have been trying to get murder charges on this cop for the past fourteen years,” Young told APN. Representatives from the Jacksonville 19 who were arrested for protesting racism were present. They shut down the Hart Bridge in Jacksonville, Florida, to demand justice for Eric Garner. Another participant, Gregory Koger, told about being in the Pontiac Correctional Center in Illinois, a long term disciplinary and segregation unit. “I went to prison when I was seventeen and spent over six years in solitary confinement conditions that under international law are considered torture,” Gregory Koger told APN. Koger described that he was in a cell so small he could reach out and touch both walls. “We were kept in our individual cells 24 hours a day and only allowed one fifteen minute shower a week. Two times a week we were allegedly allowed to go outside to an individual ‘dog’ cage, but they would find ways to prevent you from actually going out,” Koger said. Koger explained that inmates who once could hold a rational conversation, after months and years being in those conditions, were no longer functional and could no longer do so. “It is psychologically designed to destroy people’s mental, cognitive, emotional, and psychological facilities,” Koger said. Another mother told how her son was murdered by police in Stockton, California, on July 22, 2010. “My son, James Earl Rivera, Jr., was only sixteen years old and unarmed when three police officers shot 48 rounds into his van with 18 rounds entering his body and killing him,” Dionne Smith Downs told APN. Downs told how the officers crashed Rivera’s van, using a pit maneuver, into a building. Twelve officers got out of their cars with guns pointed at the van. Three of those officers, Eric Azarvand, Gregory Dunn, and John Nesbitt opened fire with an AR15 assault weapon and 9MM handguns. His family is demanding an independent investigation into why their unarmed, teenage son was murdered. Across the country, resistance is emerging to the ongoing killings of Black, Brown, and other citizens by militarized police forces. “The resistance will not stop until the police stop killing Black and Brown people. It’s on them to stop, the people can’t stop until they stop,” Tee Stern, Revolution Books, told APN.